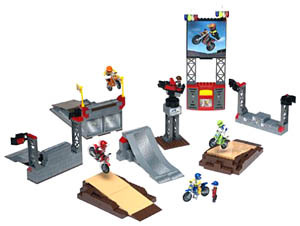 Xtreme Sports Moto X Park by Mega Bloks. With nearly 400 parts, this big Mega Bloks kit contains everything needed to put together and operate a whole motocross arena. There are ramps, billboards, loudspeaker towers, floodlight towers--and plenty of bikes and riders. Stunt sticks are also included for helping those little plastic guys to jump, slide, and pose in mid-wheelie. Decals create advertisements, a steel deck look for the jumps, and other effects. As with all Mega Bloks parts, the characters have interchangeable helmets etc., and the motorcycles have removable wheels and tires.